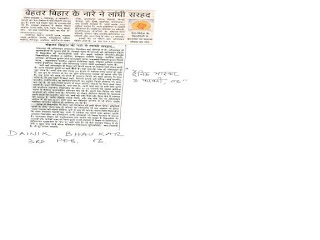 Patna Feb4,06 : Dainik Bhaskar udaipur (Rajasthan) Published news on BiharBrains on Feb 4-06. The same news daily published in all the editions of Dainik bhaskar in northern India. Thx to Sri Swayam Prakash for forming article on BiharBrains.